When I was drawing this picture, I was trying to get more strands of hair, and less 'whole-sections' or 'clumps' of hair. 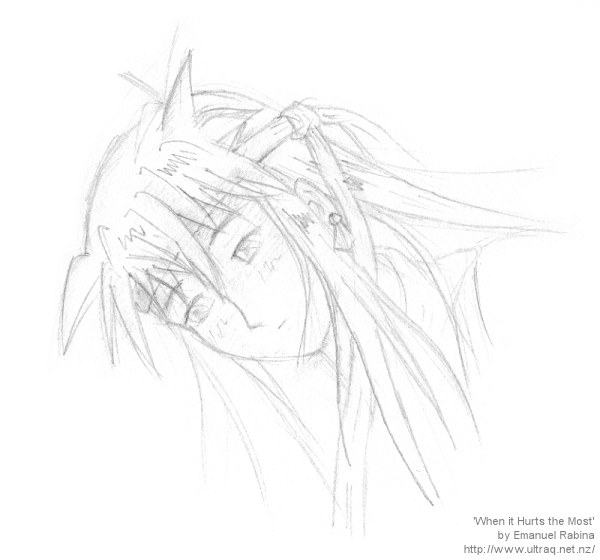 That was my main mission at the time (I have pages of drawings of hair in my sketch book now), and this is apparently the best I could do for the emotion shown. I even tried colouring it in with Paint Shop Pro 7 as usual, but I got half-way through, and just reckoned that the colouring-in process wasn't at all doing the picture justice (trust me, it was horrible).